“No toys today, baby,” I remind Buttercup as we walk into the first store. It’s an errand kind of day with The Husband, and because we recently found out Buttercup is allergic to the Mesquite trees so prevalent in Arizona it’s hard not to trip on one every time you turn around, we promised her some indoor crafty stuff at Joanne Fabrics. “We have to save our money for the fun stuff.” “Okay, Mama,” she says happily. The kid is smart enough to know that she’s gonna score with more than she will actually ask for if she lets Mama and Daddy lead the Spoil Train. The first stop is Bed Bath & Beyond. The Husband wants a new pizza stone. “Oh, mama!” Her voice is full of wonder. “Look!” She’s looking at one of those little whisks with a pink piggy-shaped handle manufactured solely for the purpose of the impulse buy. The Evil Marketing Geniuses who decide what gets placed where in the stores for optimal sales have oh so cleverly put this little gem on an end-rack at the approximate eye-level of a three-year-old. “Can I buy it, Mama? It’s my favorite!” The Husband and I trade glances, waiting to see who snaps first. “Pleaaaaasssee? I looooove it.” I look away. I count to three. “Mama…? “Ok, you can have it.” The Husband smiles sheepishly. He cracked first. I won this round. Our next stop is the crafting department at Joanne Fabrics. It’s hard to keep a preschooler occupied when she can’t go outside to play in the world’s biggest sandbox during Spring Break, so we figured a few little indoor projects might take her mind off of the park she keeps asking me to take her to. I figured maybe three or four $5 craft jobs involving lots of glitter, goopy glue, and construction paper. “Oh, baby! Look at this!” I point out the wooden eggs made for painting. Easter is coming. I grab two sets and the required paint. And the brushes. And stencils because I totally need them for the designs I am planning. “Wanna make eggs with me?” The Husband gives me a look. I raise an eyebrow. So what if this one is more for me than for her? As we stroll through the store, random items are thrown into the cart. Make Your Own Memory Book. A photo frame to decorate along with the glitter glue sticks and the foamy stickers to make it pretty. A wooden jewelry box and more paint (because this one needs these colors, Mama!) A doll-making kit. A necklace making kit. And a set to create our own bunny and chick figurines at home. Buttercup hasn’t even asked for one thing yet. All she has done is smile and nod enthusiastically when asked if she wanted to make (insert item here) with Mama. She says nothing until we pass the American Girl doll knock-offs placed, yet again, at exactly the height a three-year-old will see them first, allowing them enough time to perfect the pout and catch their parents off-guard. Sneaky Marketing Bastards. “Mama! Daddy!” she picks up a doll box and hugs it tight. “ I loooove her! She is my favorite!” “How much?” Asks The Husband, without skipping a beat. “Twenty bucks,” I say. “Put her in the cart.” “Wait, let’s pick out a dress and a pair of shoes, too. Oh, and pajamas. Hey, look. These are on clearance.” I almost choose a pair of sunglasses, too, but stop short before it becomes even more painfully obvious I want my own doll, too. We don’t make eye contact. This round is a draw since we both cracked under the pressure of blinking eyelashes and spiral curls looking up at us with love. Into the over-flowing cart the doll named Sophia goes, and I hand Buttercup her piggy bank money just for a special purchase of her own. 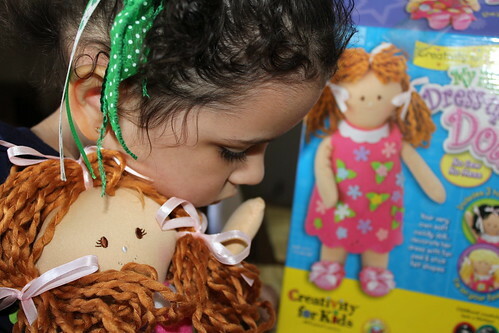 She pays for the doll that she has already dubbed her Best Friend Ever. We pay for the $130 worth of Crap She Didn’t Ask For. Buttercup: 1. Parents: Suckered.